It's been a while since the last freebie but I have been busy some designs for my website shop. Anyway this is the one I have for you today - a stencil type overlay that just needs some coloured card putting behind it then mounting on to a blank card base. 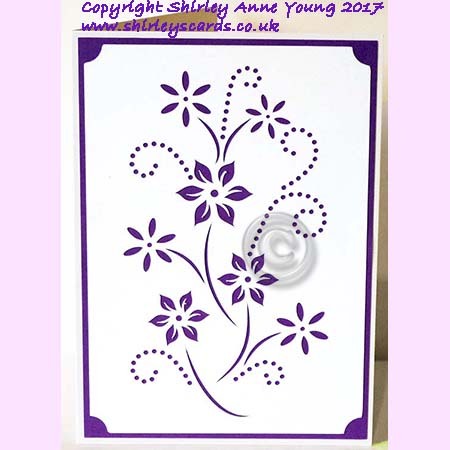 Alternatively you could use the cut file as a stencil and then just use a stencil brush or sponge to ink over the cut out parts on to your card base. Also my Blogging friend Faith posted a photo of how she has decorated her Cameo and I promised I would show a picture of what I did to my Cameo 3 so here it is. I really love this machine. I don't usually buy anything from the Silhouette Store but I got a free trial subscription with the machine so purchased the Fairy. Don't think you can tell from the photo but she is cut from Glitter vinyl. I love using vinyl as it cuts beautifully. Anyway I hope you like the freebie and here are the download links. Please leave a comment if you download it. What a pretty file, thank you so much. Love the decoration on your Cameo. hi, I love the design that you did. may I ask a few questions? I have an old cricut. i'm finding that I want to graduate to a more versatile machine. I see you use cameo. my questions are two or three part. what does cameo do that cricut or the brother cut n boss doesn't do? the other question is about files and extensions. are the files that you design compatible with the other machines? thanks for any info that would help me decide which to get. Another gorgeous card! Thank you for sharing all your beautiful creations. Wow! That is beautiful! Thanks so much for sharing it! Beautiful card. Thank you so much! I LOVE the delicate flower on the file Shirley. A beautiful file. Thanks for sharing this wonderful file and your Cameo looks lovely! Thank you! I'm looking forward to using this beautiful design. I like how you customized your cutter! Tinkerbell is my daughter's favorite Disney character. Thank you for the pretty card file.